9000 Series Labeling Systems consists of semi-automatic label applicators, fully automatic wrap labeling systems, front and back labelers, top and bottom units. 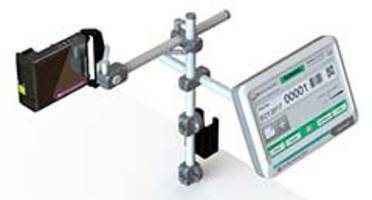 Model EPI-9230 provides vertical and horizontal adjustments. This unit is suitable for baked goods, produce, confectioneries and clamshells. EPI-9230 system is equipped with M-series labeling heads. The dual wiping mechanism of the system tightly secures the labels. 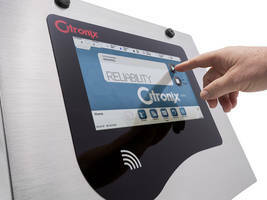 ID Technology announces the launch of the 9000 Series of Pressure Sensitive Labeling Systems. Built in the USA in Oakland, NJ, New Freedom, PA and Fort Worth, TX, the 9000 Series is a range of robust, competitively priced labeling equipment designed to handle a wide range of applications. Systems include semi-automatic label applicators, fully automatic wrap labeling systems, front and back labelers, top and bottom units and even clamshell labeling equipment. All are designed to be simple to install, use and maintain. A unique product in this line of labeling equipment is the Model EPI-9230, a hybrid labeling system that is a combination of ID Technology’s Top/Bottom System and C-Wrap System that integrates right into your specific packaging process. EPI-9230 comes with a full belt infeed conveyor and a split belt outfeed conveyor. 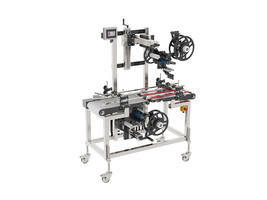 It uses two of the proven M-Series labeling heads to dispense the labels. Labels can be applied around the top, front and bottom of a clamshell container or the top and/or bottom of the packaging. 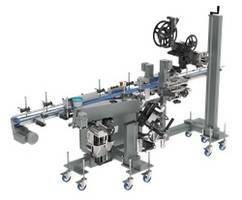 It features simple vertical and horizontal adjustments to allow for quick and reliable label placement. After the label is applied to the package there is a dual wiping mechanism that firmly secures the labels. EPI-9230 is a great labeler to ensure that containers remain closed from the packaging line all the way to the retail shelf. The EPI-9230 is ideal for baked goods, produce, confectioneries, clamshells and more. To complement their labeling systems, ID Technology offers customers using ID Technology labels a lifetime equipment warranty on their 9000 Series label application systems. ID Technology designs, manufactures, and integrates custom identification systems and is recognized as a leading single-source provider for labeling, coding and marking equipment, expertise, service and supplies. ID Technology is based in Fort Worth, Texas and operates 17 regional offices across the United States and Canada. For more information or to locate one of the ID Technology nationwide sales and service centers, call 888.438.3242 or visit our website at www.idtechnology.com. ID Technology is a brand of Pro Mach, a Cincinnati, Ohio based provider of integrated packaging and processing products and solutions for food, beverage, consumer goods, pharmaceutical, and other diverse companies. Through multiple brands, Pro Mach provides product packaging and processing equipment, PMMI certified training, installation, parts, and service in Bottling & Capping, Primary Packaging, Flexible Packaging, Material Handling, Identification & Tracking, and End of Line Packaging. For more information about Pro Mach visit www.ProMachBuilt.com.